Born in Kingston, Jamaica W.I., and raised in southern California, singer/songwriter Philip Bardowell was introduced to music at an early age when he began piano lessons at the age of five. He was influenced early on by songwriting greats: The Beatles, Elton John, Led Zeppelin, and Bob Marley to name a few. By the age of twelve, he taught himself how to play guitar and formed his first band, along with his brother Habib and their friend “Full House” actor, John Stamos. At the age of 21, already an accomplished pianist and guitarist, Philip found himself on the road backing the legendary surf duo, Jan and Dean and consequently, Mike Love of the legendary Beach Boys in his Endless Summer Beach Band. By the age of 27, Philip teamed up with Peter Criss and Ace Frehley of KISS fronting Peter’s band “CRISS” as lead singer and rhythm guitarist after a friend suggested that he audition for the position. After serving this role for two years, Philip befriended Beach Boy, Carl Wilson when Carl heard Philip sing at a birthday party for Mike Love. It was there that Philip’s voice caught Carl’s attention and prompted him to call on Philip to sing his parts as a member of the Beach Boys touring band when he became stricken with cancer. After Carl’s passing in 1996, Philip continued in his role as lead guitarist and vocalist for the Beach Boys until 2001 when he left the band to pursue a solo career. Philip’s first solo album, “In A Perfect World…”, a collaboration with producer, Bruce Gowdy (his future band mate in Unruly Child) was released later that year and was met with success and great reviews. It immediately got Philip’s music noticed by the likes of radio personalities Mark and Brian of 95.5 KLOS in Los Angeles who invited Philip with his newly-formed band, Day After Rain, to play a one hour set live on-air as the winner of the Mark And Brian Best Unsigned Artist competition. Philip and his band’s performance on that show prompted T.V. personality, Wayne Brady to call in and invite the band to appear on the Wayne Brady Show. Best known for his role as lead vocalist in UNRULY CHILD in their latest studio album “UCIII”, Philip Bardowell was also part of the band MAGDALEN together with former House of Lords members Chuck Wright, Lanny Cordola and Ken Mary. His voice has often been compared to such masters as Lou Gramm (Foreigner) and Mark Free. 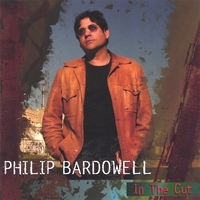 “In The Cut” is a solo step from Philip in a straightforward melodic rock / AOR direction and features also the songwriting contribution of such luminaries as Stan Bush, Jim Peterik (Survivor, Pride of Lions), Mark Spiro (House of Lords, Bad English), Bobby Barth (Axe) and Curt Cuomo (Kiss, Steve Perry). The overall result will make all fans of Signal, early Unruly Child, Stan Bush and Survivor fans jump from their chairs ! In particular, songs like “Through My Eyes”, “It’s A Long Road” (included on the label sampler “Rock The Bones Vol.III”) or “Never Too Late For Love” are nothing else than pure melodic rock ecstasy! The album production was handled by Swedish guitar master Tommy Denander (Radioactive) with Daniel Flores (Mind's Eye, Xsavior) handling drums.